Smoke billows behind rows of burnt-out cars at the site of a series of explosions at a chemical storage warehouse in Tianjin on August 13, 2015. Massive explosions killed 173 people and injured hundreds of others. On August 12, China once again met with man-made tragedy. Massive explosions at a chemical storage warehouse in Tianjin took the lives of 173 people and injured nearly 700, some of them seriously. 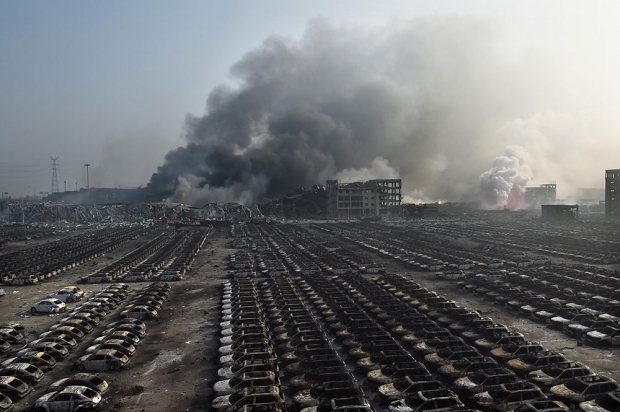 The owner of the warehouse that blew up, Rui Hai International Logistics, immediately came under intense scrutiny: how could the company allow such a thing to happen? For many, the explosion laid bare the ways in which money and political power intersect in China, and how that corrupt nexus eats away at the strength of the Chinese regulatory state, leaving public health and safety at risk. Two key shareholders in the Rui Hai company, Yu Xuewei and Dong Shexuan, had connections that had proven useful to the company: Yu formerly worked at Sinochem, a massive state-owned conglomerate with offices in Tianjin. Dong’s father is the former chief of the Tianjin police. Both men acknowledged using their connections to obtain needed approvals and permits for Rui Hai. As the investigation into the cause of the blasts continued, it became clear that Yu’s and Dong’s connections likely did more than help Rui Hai expedite permit applications. Yu and Dong may also have evaded key safety regulations as Rui Hai scaled up its operations. Perhaps most important, Rui Hai had apparently stored 700 tons of sodium cyanide at the warehouse, according to the Guangzhou-based Southern Metropolitan Daily newspaper. That amount was more than 70 times the amount that Rui Hai had been approved to hold in 2014. Sodium cyanide, which is used in gold mining, is highly toxic, and can kill quickly if inhaled. To be fair, at present, it is unclear whether all of these regulatory lapses were the result of corruption. In some cases, shoddy enforcement by regulatory agencies may be partially to blame. Nonetheless, it is noteworthy that the head of the State Administration of Work Safety, Yang Dongliang, was detained just days after the explosion, on August 18. Yang, a former vice-mayor of Tianjin, was detained for “violations of Party discipline and law,” a Party code word for graft. On August 27, the government announced that 12 company executives and 11 city and port officials had been detained or were under investigation in connection with the explosion. In his new book on Chinese governance, The China Model: Political Meritocracy and the Limits of Democracy, Daniel A. Bell, a Canadian philosopher who teaches at Tsinghua University in Beijing, argues that China has created a new governance structure, one that may, in time, prove more effective than Western constitutional democracy. The core of Bell’s argument is deceptively simple: Rather than choose political leaders through democratic processes, it may be better to select them through various meritocratic processes, including examinations and intensive study of their record of achievement in other, lower, posts. With Washington lurching from crisis to crisis, Americans in particular may find Bell’s idea intriguing. Indeed, Bell devotes an entire chapter of his book to tallying up democracy’s flaws. As Bell points out, many voters cast irrational votes, responding to emotional appeals from demagogic politicians. Others may vote their own narrow self-interest, rather than considering the needs of the country as a whole. Given the struggles of America’s political system over the past several years, Bell’s critique of democratic governance deserves close attention. But does that mean the U.S. and other democratic countries should move away from democracy and toward meritocracy? Bell’s goal is much more narrow: he seeks only to show that countries like China, which for various reasons are unable or unwilling to embrace democratic reforms, would do well to create—or in China’s case, perfect—meritocratic structures. Bell is a firm believer in the virtues of China’s meritocratic system. He argues that the success of the system is beyond reproach. “China’s rulers have presided over the single most impressive poverty alleviation achievement in history, with several hundred million people being lifted out of poverty over the past few decades,” Bell writes. Going forward, Bell believes that this three-tiered approach, with some much-needed tweaks, will ensure that China continues on the path of development, and that those problems that have emerged over the past three decades—including record levels of pollution, rampant corruption, and growing concerns about the quality and safety of everything from baby food to bullet trains—will be solved by senior leaders who are among the best and the brightest in China. To be fair, Bell acknowledges that, as yet, China has not perfected the meritocratic system. There is “a large gap between the meritocratic ideal described here and the reality in contemporary China,” he admits. That said, Bell believes that the progress toward such a system has been strong, and that prospects for continued movement toward that ideal are good. Bell has been accused, more than once, of being an apologist for Chinese authoritarianism. I don’t think that is quite right. In Bell’s view, democratization in China is “a non-question, politically speaking”; since the Party won’t let meaningful democratic reform at all levels of government happen, there is no sense, he believes, in wasting time discussing its applicability to China. He also calls, at least in passing, for better protection of basic rights, and for more robust public participation in government decision-making. Those qualifications and caveats aside, does Bell’s argument measure up? Is China creating a new meritocratic system deserving of serious attention, one which could knock democracy from its pedestal? In a word: no. First and foremost, Bell fails to make the case that China is in fact a meritocracy, or that it is well on its way to becoming one. His claims for the various levels of Chinese government—democracy at the bottom, innovation in the middle, and meritocracy at the top—fail to convince, and run against much of what we know about Chinese politics and governance. Take the system of village elections, for example—Bell’s democracy at the bottom. Bell claims that “the general trend is that local elections have become more free and fair.” But he neglects to mention case after case of exclusion—or even imprisonment—of local candidates whose views are too liberal for local Party officials’ taste. Bell suggests that local elections are evolving, but decades after the experiment was begun severe limits on campaigning by local candidates persist, leaving incumbents with a decided advantage. What about innovation in the middle? It is true that many liberal reforms have been introduced by well-meaning mid-level officials over the years. American experts (myself included) have logged countless hours talking to Chinese counterparts about such basics as budget transparency, freedom of information laws, and consultative governance mechanisms. While many of these reforms have made a difference, none of them has been truly transformative, in most cases because the reforms have not been scaled up. All too often, as Joseph Fewsmith points out in his excellent review of pilot reform projects, The Logic and Limits of Political Reform in China, such reforms eventually lose steam and peter out. What about meritocracy at the top? Here Bell is making perhaps his largest claim, arguing that “only those with an excellent record of past performance are likely to make it to the highest levels of government.” At the risk of stating the obvious, China has many dedicated, hard-working, and highly knowledgeable officials at all levels of the bureaucracy, and it is true that some reforms have been introduced to make cadre selection and promotion more meritocratic. Most experts, however, have concluded that those efforts have been swamped by other considerations, including corruption and assessments of political loyalty. Bell’s argument that China’s leaders are chosen through apolitical meritocratic processes would be strengthened if he had given some specific examples of the meritocratic process at work. Which senior officials’ careers exemplify the processes that Bell describes? Bell doesn’t say. Indeed, the two senior leaders whose careers and ideas are most discussed in the book are not Chinese but Singaporean: the recently-deceased Lee Kwan Yew and his son, Lee Hsien Loong. One might well question whether the prior leadership team of Hu Jintao and Wen Jiabao, who were widely derided when they stepped down for presiding over a “lost decade” of missed opportunities for deeper political and economic reforms, truly do represent the fruits of a meritocratic selection process. At times, Bell seems to downplay developments which run counter to his thesis. Toward the end of his book, for example, Bell tells us that “examinations have largely been discontinued as a way of assessing performance,” a change which Bell reluctantly acknowledges might have been motivated by “political rather than scientific considerations.” Shouldn’t Bell have given such a change, which would seem to undercut his central claim that meritocracy is growing ever stronger in China, much closer consideration? Those concerns aside, what is most troubling in the book is Bell’s seeming lack of understanding of the role that repression plays in the maintenance of political power in China. As noted above, Bell does call for better protection of basic rights in China. But he seems to view rights abuses by the Chinese government as a needless and outdated appendage of an increasingly technocratic system, one that will no doubt fall away over time. It seems more likely that, as public discontent continues to grow as the economy slows, Beijing’s reliance on repression, censorship, coercion, and manipulation will grow along with it. Sadly, in the first two years of Xi Jinping’s tenure, we have seen abundant evidence of just such a pattern, with scores of activists jailed, media and Internet censorship on the rise, and key NGOs shut down. These trends are not aberrations; rather, they are a key component of the leadership’s governance strategy. Thinking about Bell’s book in light of the Tianjin tragedy, and in light of the parade of senior officials (now numbering in the hundreds of thousands, according to official statistics) caught up in Xi Jinping’s anti-corruption campaign, a paradox emerges: How can a political system be growing more corrupt and more meritocratic at the same time? Wouldn’t meritocratically-selected officials be immune to gifts, or even pressure, brought by executives like Dong Shexuan and Yu Xuewei? Bell’s failure to answer this question is a key shortcoming of the book. Bell is right that we do need to understand the Chinese political system on its own terms. He is also right that we need to ask hard questions about the C.C.P. leadership’s commitment to liberal political reform. Yet Bell’s book sadly falls short of its stated goal of helping us to better understand the Chinese political system in practice. Instead, it offers a paean to a system that doesn’t exist.